Proximity to international schools, if you have any children of school going age. 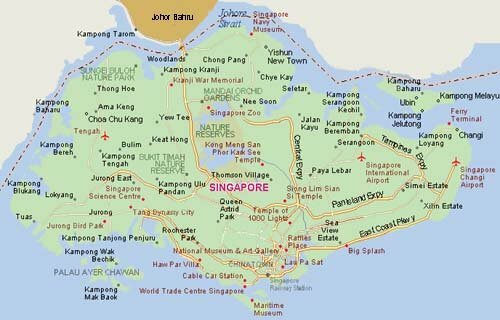 Let's have a look at the regions in Singapore first and then tackle the main factors in detail. Central areas offer some of the most luxurious and expensive living in Singapore. Tanglin area and the road towards Holland Village at the end of Orchard Road is probably the most prestigious - and most embassies are located around here as well. Newton (north of Orchard) and River Valley (south of Orchard) are more popular among single professionals and young couples. The Singapore river area (Robertson Quay, Clarke Quay & Boat Quay) has especially been rejuvenated in the recent years and boasts now numerous restaurants and bars. On the other hand, there are few condominiums in the CBD and the activity can be somewhat quiet during the evenings as it is mostly offices. Central areas offer very short distances to most free time attractions and are also well served by public transportation to and from to various parts of the island. Bukit Timah area has many landed properties, but there are also some condominiums to choose from. It would be a good choice if you want a landed property and/or live in a quieter neighbourhood. It also has many good schools and is popular among families. 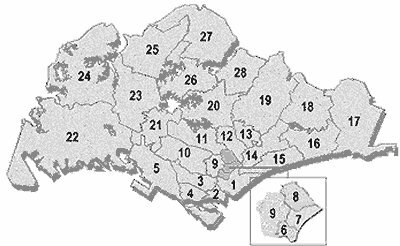 Many well-off Singaporeans also live in this area. Holland Village is popular hang-out place among expatriates living in the area and it has quite a few restaurants and bars, as well as some shopping amenities for daily needs. Bukit Timah Nature Reserve and water reservoir areas are also nearby. They are the biggest green spaces in Singapore and are very popular for outdoor activities. The road from CBD towards Changi Airport, know as East Coast, has numerous Condominiums to choose from - some with a very nice sea view. The condominiums tend to be more expensive closer to the city centre (known as Tanjong Rhu area). Apart from the attraction of living close to the sea, there is also East Coast Park that stretches along the coast and gives numerous free time options for the outdoor types. Parkway Parade offers some large scale shopping in the middle of East Coast. The biggest downside in the east coast is probably the distance to the MRT line. The Eastern MRT line does not go along the coastline, and you would have to take a bus to the MRT station, or just use a taxi, if you do not opt for own car. However, a new Circle Line due to be completed by 2010 will add 4 new stops to the West side of the East Coast area. It is not to say that there are no other options for expatriates. There are condominiums and private housing on offer all around the island and you may also get more for your money than in the most popular areas. Notably Woodlands is popular among American Expatriates, because of the American school and the spacious housing offered there - preference among them being for landed properties. ^ Prices quoted are subject to location, condition, age of property. And whether apartment is partial or fully furnished. Expats typically live in either an apartment/condominium or a landed house. This is a matter of preference and budget. Typical condominiums in Singapore have multitude of facilities - e.g. swimming pool, gym, tennis courts, children playground, and BBQ pits. And they are usually within a walled compound with security guards around, although Singapore is not a dangerous place at all. Because the plot sizes are relatively small in Singapore, only the very luxurious landed properties have pools and other facilities. For somebody moving from a colder climate, you have to also remember that Singapore is in the tropics and there are more small animals (insects, geckos) around than you may be used to. These tend to cause more problems in landed properties, especially close to green areas. But if you have the budget, there are some very nice bungalows to live in that will give you the luxury and privacy that a condominium would not be able to do. Singapore has one of the most modern and best functioning transportation systems in the world, and travelling from any point in the island to another does not take very long in normal conditions. Car ownership can be expensive in Singapore, but on the other hand the roads are good and less congested than in many other cities of similar population density. Public transportation is also very good, but tends to be more concentrated in areas where the Singaporeans live (close to HDB estates). In any case, unless you really live at the edge of Singapore, your commuting time would rarely exceed one hour. MRT, Singapore’s metro/underground system, currently has 3 lines (4th being built currently). 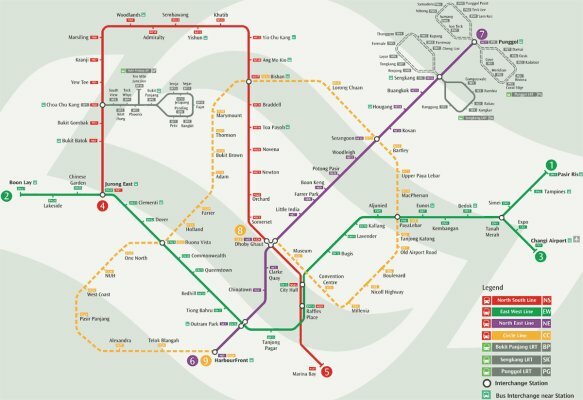 Our map search shows the location of MRT stations in Singapore. We will also give you details of the distance to the closest MRT station for each listing. Taxis are generally plentiful and cheap compared to many other countries. This would probably be the transport of choice for most single professionals living close to the city centre. Sometimes it can be difficult to get one during peak hours, and extra charges apply for calling one and during peak hours. Owning a private car is expensive relative to many other countries and is not really necessary in Singapore. Most people would save money by using taxi rather than owning a car. However, owning a car gives you freedom to move around - and popping to Malaysia every now and then to have a round of golf might be a big enough reason to get one. Purchase price – Cars are probably one of the most expensive in the world to buy in Singapore due to import duties and Certificate of Entitlement (COE – a permission to own a car for 10 years, after which it has to be renewed). Road tax – depending on the size of the engine, you need to pay road tax every year. This can vary from a few hundred for a small car to thousands for an SUV. Parking – parking may or may not be offered for free at your office. Especially, in CBD it can be quite expensive. Also, typically you would have to pay for parking in most locations when out in town. Condominiums usually have parking included in the maintenance fee (which is paid by the landlord). Petrol – it may come as a surprise, but petrol is probably the smallest component of you car ownership costs. It is currently around S$1.80 / litre. You will also need to convert your driver's license into Singaporean once within a year. This is relatively straightforward process, but will require you to sit the basic theory test. The road traffic in Singapore is on the left side of the road (as in UK and Malaysia). There are many international schools in Singapore to cater for the needs of expatriates. For most large groups of expatriates, you have a choice of sending your children to a school which follow your national curriculum and teaching is in your native language. These are the main international schools in Singapore – please check their websites for more information.